Location: located northwest of Klerksdorp, North West Province, South Africa. Travel northwest out of Klerksdorp, direction Ventersdorp for 2km on the R30. Turn right on the Buffeldoorn Road and follow this for 20km. Turn right at the Bosworth Stud sign and go to the Farmhouse where the orfords will direct you to the site. What is there to see? A large rock engraving site with over 400 Bushman and Khoe herder rock engravings. The site is notable for the many depictions of human figures. Look out for the charging rhinoceros, the large elephant, the man and ostrich dancing, the flight of birds and the many geometric motifs. Bosworth also has many stone artifacts dating from over 1 million years ago. Please leave everything as you find it. Additional information: Let the Orfords know you are coming well in advance. A visitor's fee is levied for a guided tour. Bosworth is one of South Africa's 12 rock art National Monuments. Klerksdorp has most facilities. 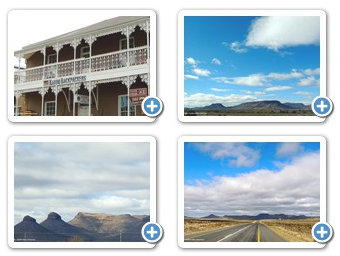 Also situated on the N12 Treasure Route this National Heritage Site is over 2000 million years old. Goudkoppie prominently features and old ammunition container, which was used by soldiers in the Second World War of Independence. Replicas of Tswana Huts Ca 1750-1820 can also be viewed at this fascinating site. The NG Mother Church (1898), Nederduitch Hervormde Church and Museum (1866) are beautiful and interesting tourist attractions. Is housed in the Old Prison. The original prison was built of raw clay-bricks and the doors were seldom locked. The only "safety precaution" was a furrow a few centimeters deep around the building which was probably only able to keep the most "honest swindlers" inside. Due to the absence of a hospital in Klerksdorp, patients were sometimes sent to this prison for "treatment" during the 1880's. Following the discovery of gold, scores of fortune hunters flocked to the new gold fields during 1887/1888, and it soon became necessary to construct an affective prison, and tenders for the building of a prison were requested in the Government Gazette of 6 January 1890. S. Wierda, a Dutch immigrant and also the State Architect of the ZAR designed the buildings. The sandstone building was completed in 1891, as can still be seen above the main entrance. During the Second War of Independence (1889-1902), when Klerksdorp was alternately occupied by the British and Boer forces, the building was also used for detention of prisoners of war. It was used as a prison until May 1973. No execution took place in this goal, but occasionally prisoners where murdered by fellow prisoners. During 1975, the Town Council appointed the first museum staff and work towards the realization of the museum started in earnest. On 26 January 1977, the museum opened its doors to the public. Beautiful wrought iron gates were installed in front of the museum. These had been used in front of the Klerksdorp Stock Exchange building since 1889. The building was demolished many years ago. To the left of the main entrance to the museum is an iron hitching post to which horses were tied in bygone days. This particular one was originally used at the Old Cemetery. Because the museum building was originally erected as a prison and used as such for many years, some rooms were reserved for goal exhibitions. All other exhibitions in the museum deal with social history or physical science and bear in reference to the prison. (1899-1902) This exhibition has three subdivisions. The first part shows some articles actually used by soldiers during the war. Then follows a collection of souvenirs made by Boer prisoners of war. The tent is a representation of one used by the Boer delegates who gathered on the banks of the Skoonspruit to discuss peace proposals before leaving for Pretoria and finally Vereeninging. The chairs are those actually used on the occasion. An archaeological gem is situated on Bosworth Farm where rock engravings that date back to as far as 1884.